The Modern Pioneer Farmer Boys are embarking on a new and exciting adventure into learning about Citizenship, Friendship, Leadership and Growing from Boyhood into Manhood. Along the way they will learn many skills that are just plain fun… like camping, hiking, fishing and how to whittle (eventually). Of course I am talking about Cub Scouts and later on, as they get older, Boy Scouts. I was reading an article today regarding the decline in reading skills and literacy among males in the United States. The statistics quoted in the article showed a steady, but alarming decline in both the interest and ability to read among American Boys as compared to their female classmates and sisters. Our country has been in the cultural pattern of infantiling it’s young males for almost as long as I’ve been alive and developed an educational system that very strongly favors girls… sad, but true. It got me thinking and wondering just how closely this educational decline in boys, overlaps not only with the advent and rise in popularity of video gaming, computer gaming, cell phones and other electronic gadgets and the “sports groupie parents'” quest to produce the next Tiger Woods, Michael Jordan or Babe Ruth… but also in the declining numbers of young boys joining in Boy Scout’s activities, 4-H and other activity groups that teach kids wisdom, resourcefulness, honor, obedience, effort, diligence and responsibility like Awanas, Girl Scouts, Campfire Kids etc… I am wondering if those declining scouts statistics would very closely match this educational decline in our boys??? Well, my friends, I hope this month of September is finding you all healthy, happy and busily harvesting if you had a garden this summer. 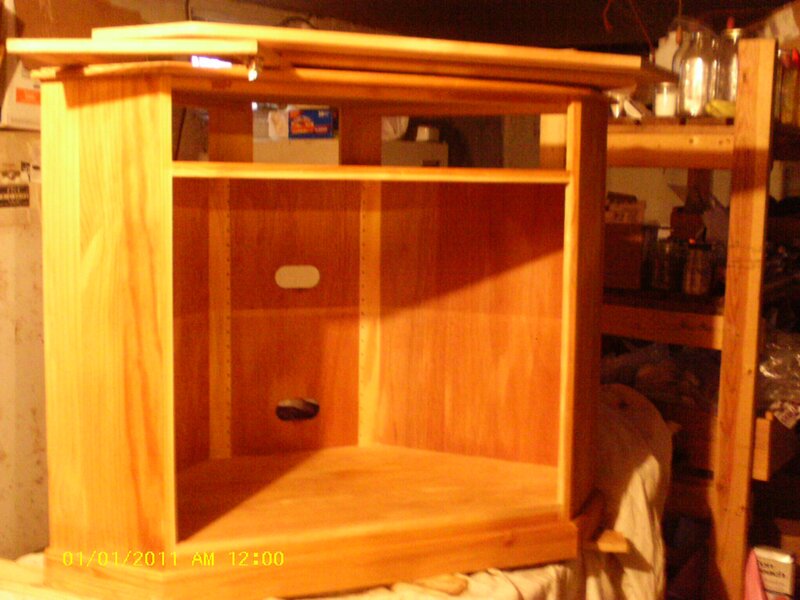 I had hoped to get busy on this series of posts of some D.I.Y. projects months ago, but as many of you know it has been a totally crazy-busy summer and not all of it in a good way… but I shall navigate my way away from that particular topic before I get on my soapbox and start preaching once again on the ills of the Nanny-State. I haven’t had much opportunity this season to be on the computer, particularly after “my brain” PINKIE (my pink laptop) died in early August. This is the 2nd hard-drive and fan that I will have to have replaced in my laptop, since purchasing it in Sept. 2009 (does not include the cd-rom that went out on it or the power jack that broke… far too many repairs for a 3 year old computer in my opinion)… so anyway, it awaits repairs until they can be afforded and for now I am using the netbook that I bought last winter to do my taxes while waiting for the power jack to get fixed (took 2 months for the repair shop to get the right part, since the manufacturer sent a dud the first time)… netbook is primarily used by the kids for research and play. The netbook is slower, but it’s been a good little computer. Lesson Learned: Don’t buy a computer because you like the color! 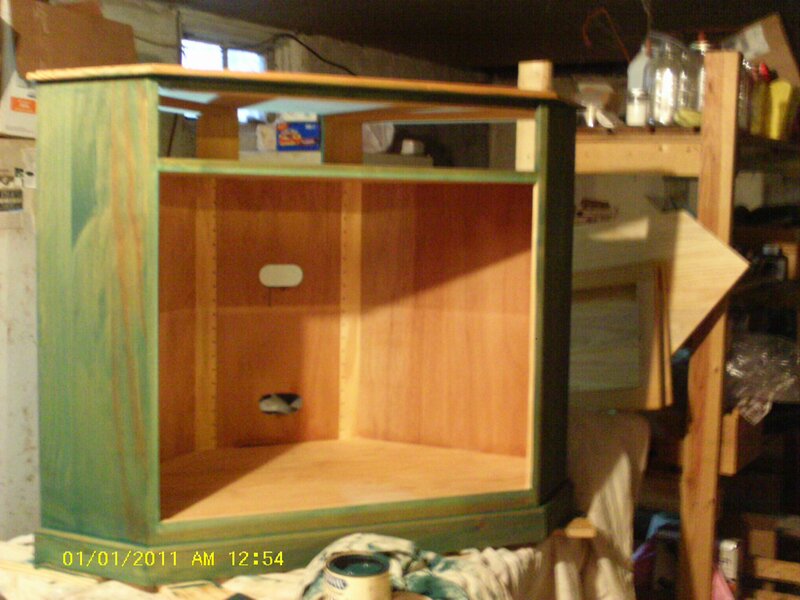 This type of project is great if you want to save a little money and like quality wood furnishings for your home. This idea is also fabulous if your personal tastes run toward the unusual, unique or funky! If you are lucky to have a shop that carries unfinished wood furniture nearby and find yourself in the market for a new desk, an entertainment center or some other wooden object for your home or office, do yourself, your pocketbook and a local business a big favor… stop by and see for yourself the unfinished gems these businesses have to offer. If you don’t have such a shop locally or within reasonable driving distance, check online and order some mail-order catalogs. We have a local shop that sells unfinished furniture and refurbished pre-loved furniture in Mitchell, SD (about 35 miles from us one-way). We love to stop in there on occassion (usually a Saturday we are in town already for an excursion to the lumberyard/home center or to the fabric store)… many times we just window-shop… other times we find a piece tha we fall in love with. Over the years we’ve purchased a pair of pre-loved wingback chairs, a loveseat, a dresser for the baby and an unfinished wood entertainment center designed to fit into a corner. 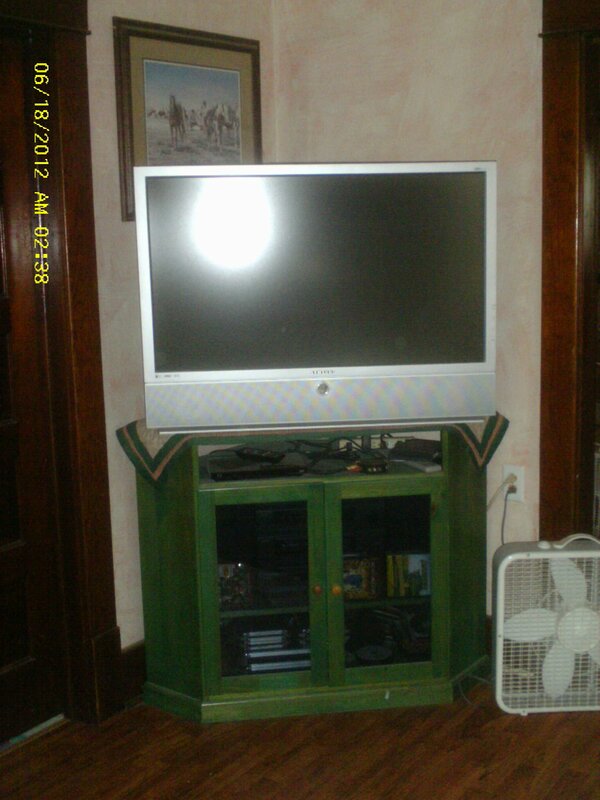 Love the entertainment center as we did, it sat in the basement for several years before we got around to working on it. There were several debates over “how we should finish it” that had to ironed out during that time and even the kids weighed in with their individual opinions on the matter. Pioneer Pa loves “wood” (as in traditional stained wood finishes)… he is fond of saying “If it’s wood, it’s good!” My answer to that is that the entertainment center is already made of wood and plain old brown wood is rather boring and lacking in personality. I love painted wood furniture, painted to look like furnishings from an 18th or 19th century farmhouse. I also love to infuse my love of color into my home. In Farmer Boy Charles’ opinion, the entertainment center should be green and yellow and John Deere all over. Henry said it should be red, white and blue… and painted like the American Flag (could have been cute, but was not going to go with anything else in the room.) As green is a favorite color of mine and several of the chairs in our living room were already green, green also going nicely with our wall color (a faux finish with an orange-peach basecoat white washed with a nearly white “peach” glaze), the pecan colored wood bookshelf and the autumn oak colored hardwood patterned vinyl flooring, we decided to go partially with Charles’ suggestion of a bright green and compromised on the stain vs. paint debate by choosing a tintable Minwax water-based stain in “Northern Ivy”. 2. If you are using the water-based wood conditioner, apply it to your furniture piece according to the manufacturer’s instructions on the product label. If you are not using the wood conditioner, skip to step #3. 3. Lightly sand your piece to remove any “raised grain” in the wood surface along with dents, scratches or other imperfections (unless you love the distressed look then you can feel free to leave some of the flaws in your furniture item), including the wooden portions of all drawers, doors and shelves. 4. Using a tack-cloth or lightly dampened rag, remove all the sanding dust, you can use a vaccum cleaner attachment to remove dust in grooves, molding/carving or other difficult places if needed. 5. If you used a damp cloth, allow several hours for any moisture to dry before proceeding. 6. Stir your stain well, particularly if it has been sitting for any length of time. Put on vinyl gloves to protect your hands and nails… stain… well… it stains. I didn’t bother with the gloves for this project and looked like a green handed monster for almost a week. You may also wish to use an old shirt and jeans (do NOT wear good clothes for this project), old shoes and possibly your husband’s old BBQ apron. Also protect your work surface with newspaper or a drop cloth. 7. 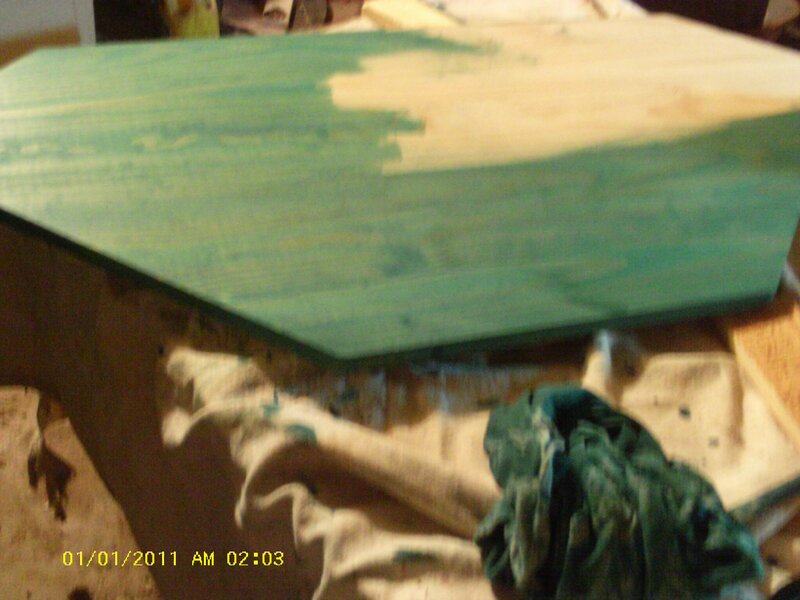 Open the can of stain and using a painters rag, test it in an inconspicuous area (like the underneath side of a drawer or the bottom of the piece) to make sure you love the color you choose (different woods will yield slightly different results with the same stain due to the natural wood color and wood grain of various species of wood). If you don’t like it, stop here and choose another color… I know that’s another trip to the hardware store… but you want to love this thing you are making for 20 or 50 years, right? 9. Using painters rags, wipe on stain in approximately 18″ x 18″ sections then wiping off excess stain with a clean painters rag. 10. Repeat step # 9 until you have stained the whole piece. 11.Allow stain to dry for several days. 12. Lightly sand any rough feeling areas where the wood grain may have raised with fine grit sandpaper. If you like a distressed look, you can also lightly sand any corners and edges to give a lightly worn appearance. 13. Using a tack cloth, remove sanding dust. 14. Apply 3 coats of spray-on or paint-on Poly-Acrylic finish in your choice of finish, allowing finish to dry and then sanding lightly with extra-fine sandpaper between the coats and removing any dust with a tack cloth. 15. Allow your project to thoroughly dry for several days. 16. Reattach all of the hardware. 17. Find a buddy to help you move the piece and place it in your room where youd like it to be.